The Melrose makes families feel right at home. Natural light warms the flowing open kitchen, café area, and breathtaking 2-story gathering room. Flex rooms downstairs provide a study, den, kid’s playroom or opt to add an additional bedroom to the first floor. Additional garage storage proves handy, and the Pulte Planning Center® helps to streamline your busy family’s life. 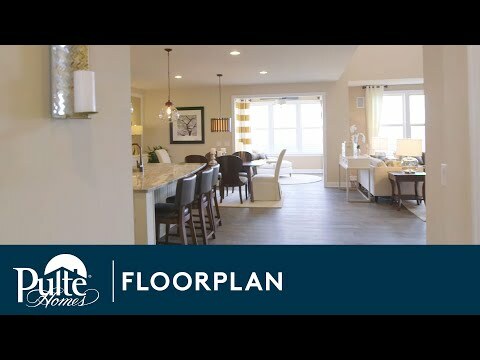 Step inside Melrose to see the Life-Tested Home Designs® with more usable space where you want it most. So you live the way you want to live. With up to six bedrooms, the expansive Melrose offers plenty of space for a large or growing family. Known for its spacious kitchen with beautiful 42" maple cabinetry, the Melrose boasts an optional butler’s pantry connecting the kitchen to the formal dining room. A large eat-in island and the café space offer more casual dining options. Enhance your living space with an optional sunroom and allow even more natural light in. Upstairs you’ll find walk-in closets in each of the four bedrooms. With up to six bedrooms, the expansive Melrose offers plenty of space for a growing family. Known for its spacious kitchen, the Melrose boasts an optional butler’s pantry. A large eat-in island and the café space offer more casual dining options.